In-building cellular networks require complex, real time remote control to maintain continuity between the outdoor and indoor cellular networks. For instance when a mobile device moves from inside a building to the outdoors, the cellular network needs to transfer the communication with the mobile device from the small cell in the building to the macro cell tower outside the building. Signaling traffic is generated between the small cell, the mobile device, the outdoor cell tower and the operator’s core network to enable this transition. This signaling is generated constantly in the background even if the person is not talking or using data at the time they walk in or out of a building. 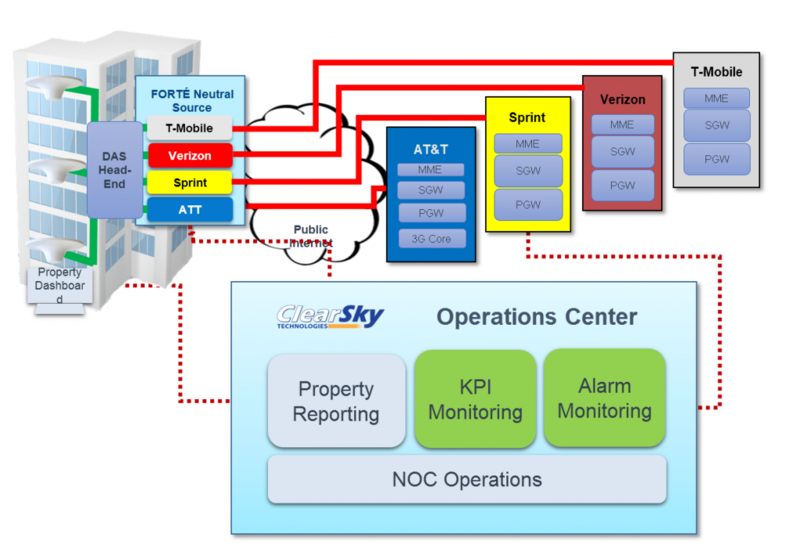 ClearSky’s proprietary FORTE® Operations Center provides all the necessary capabilities to keep in-building small cell networks functioning at peak performance. The Operations Center monitors the performance of the signaling, the amount of voice and data traffic as well as the “health” of the small cells. The Operations Center is vendor and wireless operator neutral, enabling it to work with AT&T, Verizon, T-Mobile and Sprint simultaneously. The Operations Center is designed to assure that each mobile device receives high quality service and that no device can ever be routed to the wrong operator. The Operations Center includes a reporting function that generates status and performance information for the wireless operators and the property.